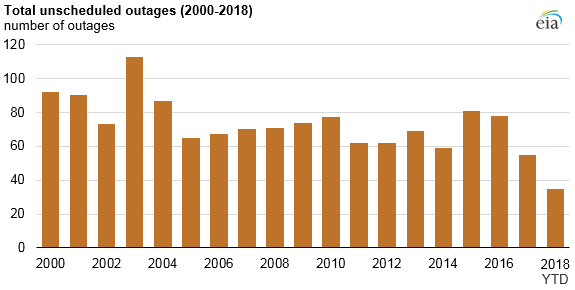 Electric generation capacity losses as a result of U.S. nuclear plant outages were relatively low during much of the 2018 summer, averaging 2.8 gigawatts (GW) from June through August. This year's seasonal maintenance and refueling cycle began earlier than in recent years, and total nuclear outages averaged 14.5 GW in the last week of September. The earlier-than-expected retirement of the Oyster Creek Generating Station and a temporary plant shutdown related to Hurricane Florence also increased outages in September. 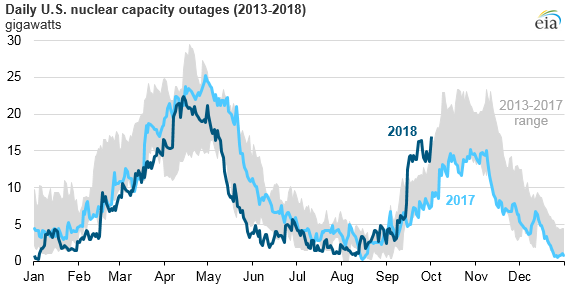 Nuclear capacity outages are typically lowest during the summer and winter months when electricity consumption is high to meet increased cooling and heating demand. Nuclear power plant outages can be either scheduled or unscheduled, and they can range from a partial outage, where only some of a plant's capacity is offline, to a full outage, where the entire plant is shut down. A scheduled shutdown of a nuclear power plant is generally timed to coincide with the plant's refueling cycle. Nuclear power plants typically refuel every 18 to 24 months, often during the fall and spring when electricity demand is lower. During a refueling outage, plants typically optimize downtime by scheduling facility upgrades, repairs, and other maintenance work to be completed while the reactor is offline. Three unscheduled outages in Tennessee, Arkansas, and Arizona affected the available summer capacity in 2018. Tennessee's Watts Bar Unit-2, the newest U.S. nuclear power plant, automatically shut down for six days after a main turbine and generator tripped on June 22. Arkansas Nuclear One Unit-1 shut down from June 23–26 to repair a leakage in the reactor coolant system. The Palo Verde Nuclear Generating Station Unit-3, located 45 miles west of Phoenix, Arizona, automatically shut down for three days beginning June 27 because of low steam generator water levels. Also in mid-September, the 625 MW Oyster Creek Nuclear Generating Plant in Forked River, New Jersey, permanently shut down. The plant was previously expected to retire on December 31, 2019, but the timeline was accelerated by more than a year to coincide with the end of the plant's final fuel and maintenance cycle. The retirement of the plant is considered an unscheduled shutdown in EIA data until the Nuclear Regulatory Commission amends its outage data to reflect the closure. 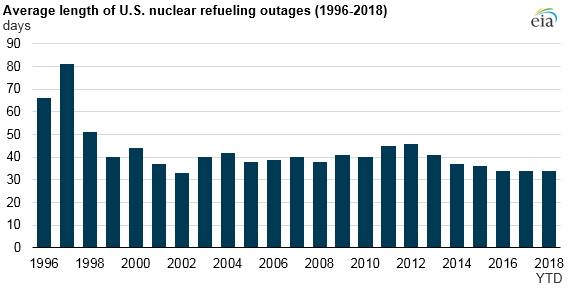 Outages are expected to continue increasing this year as nuclear plants enter the fall refueling and maintenance season. More information on the daily operation of U.S. nuclear power plants is available on EIA's Status of Nuclear Outages webpage, which is based on data collected by the U.S. Nuclear Regulatory Commission.